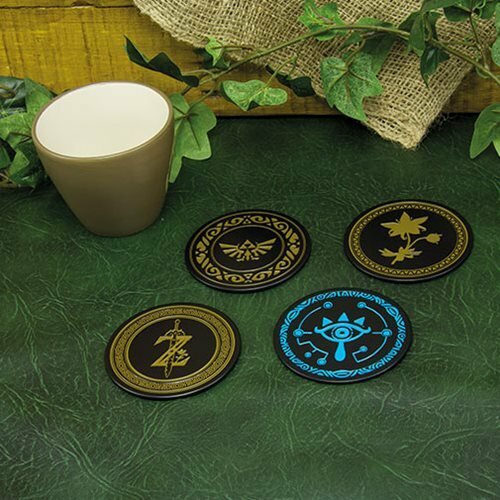 A fantastic set of themed metal coasters with designs and symbols from The Legend of Zelda: Breath of the Wild. 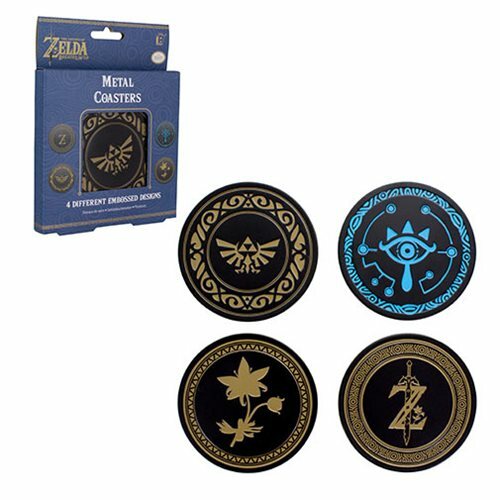 The Legend of Zelda Metal Coaster 4-Pack is perfect to protect tables and other surfaces from damage and drink stains. This set of 4 cork-backed coasters feature iconic symbols and logos from the hugely popular The Legend of Zelda series of games. The four different classic designs include the Hyrule crest, the Triforce, the Sheikah Eye and Link's Master Sword, all instantly recognizable to fans of the The Legend of Zelda games. The Legend of Zelda Metal Coaster 4-Pack is great for fans and gamers. It makes an ideal gift solution for birthdays, Christmas stocking fillers or even the office Secret Santa.